Garlic is easy to grow and virtually pest-free, so it’s well worth giving it some space – especially in a polytunnel or greenhouse. Elephant garlic in particular is an excellent ‘cash crop’ which can fetch around £5 for a single bulb. You can save some of your harvest to plant again for next year, so don’t be put off by the price from suppliers. Supermarket garlic may not grow so well in the UK climate, and you risk bringing pests or disease into your garden. Elephant garlic is not a true garlic but more closely related to leeks, even though it’s almost identical to garlic in terms of appearance – but much, much bigger! A good bulb can weigh close to a kilo. Garlic and elephant garlic can be grown outside in the UK, but it’s no coincidence that most of the domestic garlic that you’ll find for sale in gardening catalogues comes from the Isle of Wight. This, of course, is because of the climate. The problem is that if the plants get too much water at the wrong time then instead of ‘bulbing up’ they begin to grow again, forming a clump of small, crowded plants like chives. However, in a polytunnel or greenhouse, you control the watering. And, as both give you an extended gardening season, garlic grown under cover will be harvested in plenty of time to replant the beds for winter. Don’t plant garlic bought on your shopping trips. It’s always a bad idea to grow shop-bought produce for a variety of reasons, chief among these being the potential for bringing pest or disease problems into your garden. Also, shop-bought garlic varieties may not be suitable for the UK climate. Individual cloves of garlic or elephant garlic should be planted in late October or November, so that they can get going before the serious frosts arrive. Garlic can be planted in spring too, but it won’t grow as big or be ready as early as overwintered plants. The soil in your garlic bed should be well drained and reasonably fertile. Garlic loves the sun, so plant them where they will get as much as possible. As garlic doesn’t take up much space, it can be used as a ‘filler’ crop here and there, where its scent may confuse and deter pests searching for other crops such as carrots. Plant individual cloves of elephant garlic 15-20cms apart, in rows 20cm apart. ‘Regular’ garlic is done the same way, but 8-10cms apart in rows 10cms apart. Don’t push them into the earth as this compacts the soil where the roots are going to develop. Instead, dig a small hole with a fork and place the clove into it, leaving just the tip poking out of the ground. Don’t rub off any more of the papery covering than you have to, as it protects the bulb while growth gets going. After planting, give the bed a sprinkle of bonemeal to encourage strong root development, and check the bed every few days in case birds have uprooted any of the cloves. Elephant garlic will put out a flower stem (or ‘scape’) in May and these should be snapped off as soon as they’re recognized – and then turned in to pesto! Regular garlic is much less likely to flower, but if it does, give it the same treatment. Flower development takes a lot of energy, and you want it all to go into the bulbs. Towards June, both varieties will begin to die back. It’s important to reduce watering from this point on. The leaves will turn yellow as their energy is drawn down into the development of nice, fat cloves. Elephant garlic dies back less, and the bulbs should usually be lifted before the leaves have died back very substantially. If you wait too long, the plant will be off and growing again. Lift them by carefully levering them out with a fork. 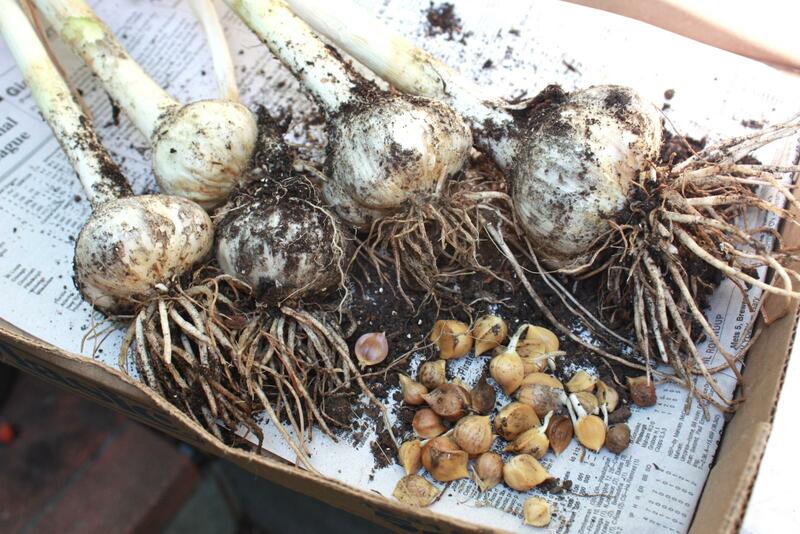 Harvest garlic and elephant garlic in June in a polytunnel or greenhouse, and July or August outside. Cut off the main stem a few centimeters above the bulb and leave it to cure in the same way as onions, i.e. in a warm, dry environment. Any residual moisture may cause them to rot in storage, but properly cured garlic can last for a year or even longer. Don’t forget to keep some of your biggest, fattest cloves to plant again in the autumn for next year’s crop. Garlic, especialy elephant garlic, is something that you should only have to buy once! The flavour of regular garlic needs no introduction. Although similar, elephant garlic is much milder and sweeter, and should be added to dishes towards the end cooking. For a real treat, roast whole cloves in their paper jackets, nip off the tops and squeeze them out onto fresh bread like toothpaste. Or, strip the paper off and roast them whole alongside other root veg until they are caramelised and delicious. Allow a couple of cloves per person – you won’t be disappointed! Like onions, garlic is prone to rust which can become worse each season. Don’t allow any volunteer plants to grow in an affected area, and don’t grow any alliums in an infected bed for at least three years. In the shelter of a tunnel or greenhouse, onion fly is unlikely to be a problem. Why not visit our forum using the link at top right? You can post pics there – I’m sure everyone will be interested! Hi , I was given some “Irish garlic” seeds [4 chestnut like root seeds and a dozen head seeds] some 5 years ago, which I was told came originally from the Aran Islands , off the West of Ireland. I have nowmultiplied my crop to some 5/600 root seeds [ brown chestnut like] and literally thousands of top seeds. I have quite a few pictures which I would liketo share, given that I have not yet discovered anything on the web about this double seeding garlc? Hi Lawrence – sounds like elephant garlic. Are these the bunnies? Sorry, but we’re unable to help! Both of us grow the garlic we use, but we’re not farming it for commercial purposes or on a commercial scale. The best we can suggest is to contact a seed supplier who may be able to help.